Until just two days ago, my morning glories were blooming furiously - I don't know if they ever lasted so late in the season. But we finally had a killing frost, so this is all I have left of them now! Hasn't this been an unusual fall..I still have hanging baskets out. Beautiful blue. I don't know if I've ever seen one so blue! Like Emily, we have purple ones here. A very lovely capture of this moist bloom. I dread seeing them peep over the fence into my garden. They are so invasive, but so beautiful, too. 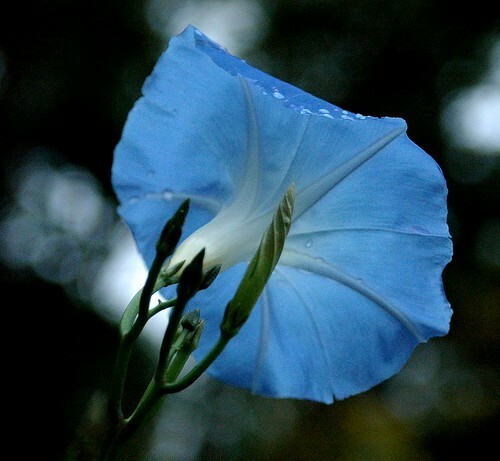 I love morning glories...nice angle for a flower photo too. Great flower and delightful photo! I would love some for my yard, it's nice to see flowers still blooming. It is a very beautiful flower...it has frosted here as well and my flowers are all gone...or at least ready for the compost heap! I've been making my way through the posts, and the blogger in Crystal Lake IL had a similar experience. But at least you got to enjoy it late in the season. Oh, this is a beautiful flower. I've never seen this color here. just beautiful! Love the water droplets! A great new angle on the morning glory. Shame they're finished now for you. Ours are still around en masse, as the weather just doesn't seem to cool & the sun's up there every day. All these blues, after my blue theme through August.